Taoblog: Wade In? Or Dive In? Can We Do It Backward? 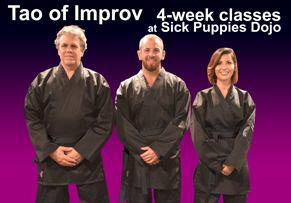 Have you taken improv classes? If so, chances are you started in some kind of beginner improv class. Improv 101. In many cases, that’s where they teach you a bunch of fun warmups. They tell you the rules of improv. They tell you to never say “no,” always say “yes,” establish the Who What Where right away. Maybe they teach you the Game of the Scene, and send you on a quest to become one with the mythical Group Mind. Then, you slowly begin to do some scenes. Perhaps your first scenes are without dialogue, or emphasize Yes, And…. Maybe you do scenes in gibberish. Maybe you learn to seek out patterns. Maybe, after much training and tons of rules and notes and drills and games, someone sits you down and tells you it’s time to do some real, grounded scene work. After all, you are told, it’s really about being in the moment and discovering along with your scene partner who you both are and how your characters feel. What if, on Day One of your Improv 101, you started with this? What if your first improv scenes were drawn from life, and resembled life? What if, before you got loaded down with all the baggage, you began by realizing that you are portraying characters with emotions, and that it doesn’t matter what you’re saying or what the plot is as long as you’re connected to the other character? What if you were told that improv is simply about being human? What if the first thing you did was to verbally mirror your fellow actor for three minutes, echoing some common phrase back and forth, changing the emphasis and emotion each time? Well, you’d notice that everyone watching was very interested in your scene, because your characters are connected. They’d even laugh. You’d also learn that they are interested in your scene despite the fact that nothing interesting or clever is being said. You’d learn that content is secondary to connection. And if you did it over and over, you’d get the same result. Your Day One would be filed with successes. You’d get an inkling of the power and purpose of scenic improv. After that, you could breathe in all the rules and games and techniques. They’d mean something to you now. Maybe you could get good at this stuff much more quickly, and each new tweak (learning about status shifts, levels of emotion or object work) would boost you into a higher orbit. Maybe you’d go forward faster if you went forward backward. Next Post Taoblog: Do You Know You?